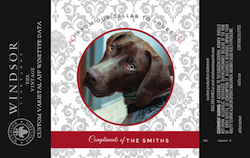 You take a look at our available dogs, but there are only a few young ones. You are about to click away when you notice one that seems to be speaking to you, but that dog is 7. Should you even consider a dog that old? 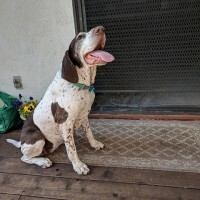 There are many advantages to adopting a mature dog, especially when it comes to GSPs. Read on for real-life questions and answers. 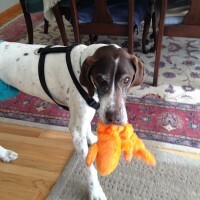 Why should you consider adopting an adult or senior dog? Click the plus icon to expand each answer below the question. I've always wanted a cute little puppy and I think I can handle it. Have you really, really thought about everything that comes with a new puppy? A new puppy means house-training, teething, 3am potty breaks, lots of vaccinations and vet trips, and energy – so much energy. When you get a GSP puppy, you will spend hours exercising the little guy just to take the edge off. If you adopt an adult dog, you get all the great benefits of having a dog without the constant monitoring that a puppy requires. 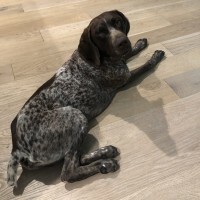 And, unless you are a marathon runner, you’ll appreciate that the mature GSP doesn’t require two hours of running per day, every day. With an adult dog, they can be part of your family from day one – our adult rescue dogs are fully vaccinated, heartworm-tested, spayed/neutered, and ready to go. No puppy shots to worry about, no puppy nipping, no puppy expenses. If I haven't raised the dog from a puppy, how do I know I'll like their personality and that they'll be a good fit for my family? If you adopt an adult dog, what you see is what you get. They are an open book. You’ll know important things like their full-grown size and personality right from the start. If you don’t like surprises, an older dog is for you! But you can't teach an old dog new tricks! Adult dogs are actually very good learners. They learn quickly and are great at focusing on you and on the task, because they’re calmer than youngsters. All those years of experience reading humans can help them quickly figure out how to do what you’re asking. Isn't it more difficult to form a bond with a dog that you haven't had since they were a puppy? Older dogs are often the last to be adopted. That’s why they are even more devoted. After an initial settling in period that comes with adopting any dog, old or young, older dogs form a lasting bond that can’t be beat! Plus, they’re good at giving love. You’ll feel the rewards every day you spend together. They are grateful for the second chance you’ve given them. I don't want an old dog who just sleeps all day. You’ll never find a GSP who just sleeps all day! 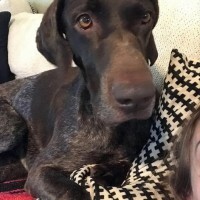 An adult GSP appreciates a good nap time, but they have oodles of energy even into their senior years, whether you want to go for a run, a hike, or play a good game of fetch. GSPs are not ones to lay down and let life pass them by! Won't I be adopting someone else's problems? If the dog were so wonderful, why wouldn't they have kept him? Dogs lose their homes for many different reasons, most of them having nothing to do with problems the dog has, but rather with those of the person or family surrendering the dog. Typical reasons include: death of a guardian, divorce, not enough time for the dog, change in work schedule, new baby, lost job and can’t afford to keep dog, need to move to a place where dogs are not allowed, kids going off to college, allergies, health issues, travel, change in “lifestyle,” prospective spouse doesn’t like dogs – you name it, we’ve heard it. Don't older dogs cost more in vet bills? 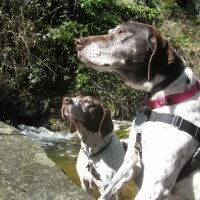 Veterinary attention and routine medications are needed at all ages and may or may not be more costly for an older dog. 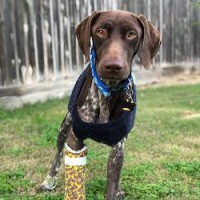 We provide you with all medical records for the care the GSP received in rescue, which you can share with your veterinarian before making a final adoption decision. I want many years with my new dog. There are never any guarantees about length of life with any dog. An older dog also has the rest of her life in front of her! Quality of time together matters a great deal more than quantity. I just lost my old dog. I'm not sure I could go through that again. Some people feel that giving a home to an older dog in need is a tribute to their former dog and actually eases their pain. It can help them to focus on the positives and to deal better with loss. I'm interested in a doggie friend, but I'm getting on in years myself. Another reason to get an older dog! Easier to care for, less exercise needed, and unlike a puppy, not a 12 – 16 year commitment. My kids want a dog, but they'll be going off to college in 5 years. 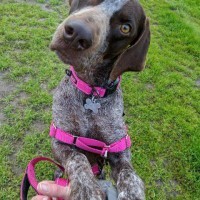 Unless you want to be caring for the dog for the next 15 years, a puppy or young GSP is not the answer. Select a mature dog for a shorter commitment. 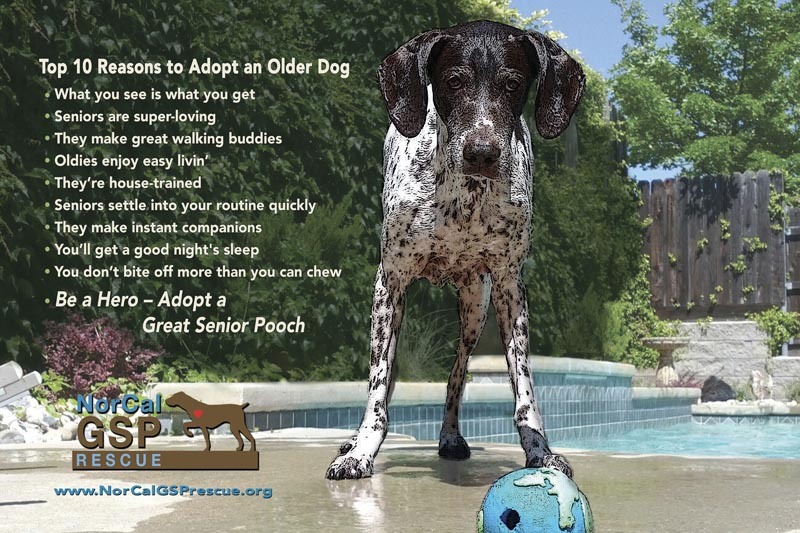 So go ahead, be a hero, and adopt an older dog! Give that dog the best years of his or her life!